Satan “the god of this world”, attempts to turn us away from our pursuit of Heaven, in hopes of detouring us back down to this present world, with all of its glittering tinsel-like treasures and earthly pleasures! And so, these are the two different pathways we must choose between. Now this all seems so simple. Just two paths to choose from! TO DECEIVE EVEN THE VERY ELECT! Yes, today’s counterfeits look so close, that there are even true Believers who attend these fallen churches! But the fact is, such worldly-compromised gospels may promise to bring happiness, but eventually only lead to sorrow and spiritual bankruptcy. From these two above verses it becomes clear that true peace, and joy, and contentment can only be found by forsaking the world’s pleasures and ambitious attainments, and instead, fully devoting oneself to the pursuit of Heaven! And so, let’s stop listening to that old serpent-salesman, who once sold a bogus-bill-of-goods to a certain naive little lady back in a very lovely garden. And instead, let’s become full-time followers of Jesus, as He leads us up that narrow pathway which leads to a brighter and deeper life of joy, love, peace and contentment! This most amazing phenomenon is seen throughout the winter. Although it can be observed most of the winter, it is seen best when it is the western part of the sky, at winter’s end (The end of winter being the final scene of this heavenly Gospel story). Orion , the Dragon, and the Glorious White Horse are beginning to descend into the western horizon (sketch to right is Winter Constellations descending into western horizon. This can actually be seen as early as December, in the pre-dawn hours). 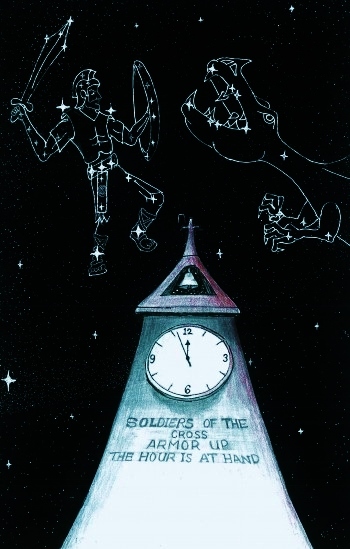 And at this point it is apparent that the Fleeing Woman of Revelation 12 Constellation is veering toward the two bright stars, known as Castor and Pollux (sketch to below left). But the Wide Gate Stars are composed of the two brightest stars of the Auriga Constellation, known as the star, Capella, and the star, Menkalinan. 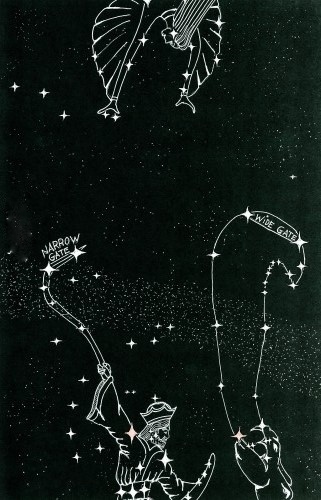 The two stars, Castor and Pollux, make up the concept of the Orion’s Narrow Gate Stars. This can even be observed into June in the western sky (for a short time just after dark). While a dark night is best for seeing the Woman Constellation, the 4 stars which comprise the Narrow Gate/Wide Gate Stars can be seen even under mediocre conditions. It begins with the Fleeing Woman of Revelation 12 Constellation (AKA Ursa Major) going towards these two doors. The sketch to left shows, the two doors are each composed of two bright stars. The two bright stars that comprise the Narrow Gate are the two brightest stars of the Orion the Reaper’s sickle. The two stars that comprise the ‘Wide Gate’ Stars are the two brightest stars of the wave of water that comes out of the Dragon Constellation’s mouth (for explanation of “Wave of Water”, just click here). The stars that make up the ‘Narrow Gate’ are about half the width of the Wide Gate (see sketch to right). Editor’s note: These sketches on this page are merely sketches. The stars are not in their exact place. However, they are close enough to find them in the night sky. But as with most stars, it takes persistence to finally locate them.